The world's oldest bible has been put online for all to see by The British Library. 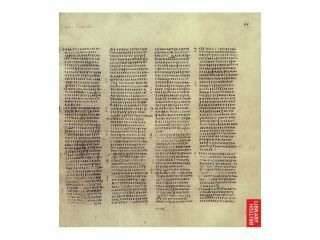 Extracts of the text titled Codex Sinaiticus have been digitised and made available for the public to view. The bible itself is controversial due to the differences between the text and bibles of today, mainly that it doesn't include the resurrection of Christ. The Codex Sinaiticus is a version of the New Testament that was hand-written in Greek over 1,600 years ago. Only 400 pages remain of the book. The whole of the book will eventually go online, with The British Library expecting the rest of the book to be uploaded by July. Speaking to Reuters, Ulrich Johannes Schneider, director of Leipzig University Library, which holds part of the manuscript, said: "I think it is fantastic that, thanks to technology, we can now make the oldest cultural artefacts, that were once so precious you couldn't show them to anyone, accessible to everyone in really high quality."